Oh, how I adore Liz and Jeff of cosa verde. We met a while back at the Summit of Awesome. Liz just sent me this update, which I'm chomping at the bit to share. I think their idea was simply brilliant. So meaningful and memorable. I'm going to shut up about it because I can't possibly do it justice. Liz, please take it away! We never wanted a ceremony. We have been together for eleven years, since high school, and while we knew a wedding was important as a way to include our friends and family in our commitment, it was also something of a non-event to us. 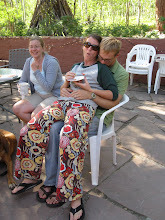 We've thought of ourselves as married for years now, and acted that way. We've gone through lots of good times as well bad times, and we worked through them as a committed couple long before our marriage certificate was signed. So when it came time to actually plan a wedding, we had a lot of discussions about what we wanted, what might be "expected" and what would be the right fit for the day. We had talked about eloping, but we knew that it was important to our families and friends to witness our union. 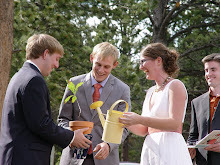 We had settled on just throwing a celebration without a ceremony, but the closer we got to our wedding day, the more I felt like we needed to do something ceremonial. It seemed like if we were gathering people to witness our union, there should be some sort of union. But neither of us was into the whole wedding thing. I don't like being the center of attention, neither of us is remotely religious, and after eleven years together, it didn't seem important to say vows--we've been saying them in the way we take care of each other for years now. So we decided to mush together a bunch of customs I'd read about and have a wrist-binding. We included a note with the invitation explaining that there would not be a traditional ceremony (I didn't want people coming with expectations) and inviting people to bring their own piece of string to help us literally "tie the knot." 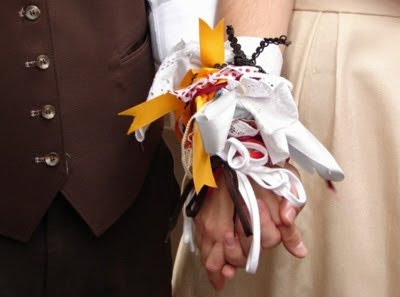 Unlike a handfasting, we didn't want this to be part of a structured ceremony, but a chance for people to have an individual moment with us as a couple during the first hour of the evening. I can't tell you how much I worried about this. It was exactly what I wanted to do, but I was afraid people would think it was too weird, and that it would wind up feeling silly instead of meaningful. But when Jeff's grandpa tied the first string onto our wrists--a piece of ribbon saved from the cake at the 50th anniversary of his wedding to Jeff's (now deceased) grandmother, I knew we had made the right choice. Some people just brought pretty ribbons, and some people used ones from the large stash we had provided, but an amazing number of our guests brought sentimental pieces to share with us. Ribbons from their own wedding gifts or favors, a piece of lace from a pillowcase made by Jeff's other (also passed) grandmother, yarn that they spun themselves. The whole thing was an incredibly affirming experience. It gave a chance for our guests to spend some time with us outside of a receiving line (where you know there's always someone waiting to be next, right behind you). It opened people up--they told us about their weddings, or their wishes for us. It made each guest a part of the wedding, which was really important to me, because, as I said earlier, a lot of this wedding was for them, not for me. 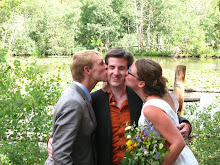 And it made us feel like each guest was affirming our choice to be together. We know we have a huge network of love and support. And the best part of it was that we were physically tied together for an hour. I've heard that the bride and groom often rarely see each other on their wedding day...well, we were stuck with each other, which meant that we both were there to hear all these wonderful stories, and that we gave out an awful lot of three-armed hugs. Wow - I'm almost speechless. What an amazing and moving post, and what a meaningful, beautiful ritual they created! How inspiring. How sentimental...I literally have tears!! What an amazing idea...kudos to the couple for stepping outside of the box. This is super cool. It's a good idea, too. What a special way to start your lives together. 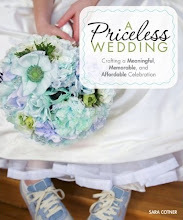 It goes to show that a wedding is about the couple getting married and their personalities, wants and wishes-- not the standards that have been set by the billion dollar industry. Kudos!